Park Woo Jin and Park Ji Hoon enjoyed a friendship trip together on 'Battle Trip'! On the May 5th episode of 'Battle Trip', the two Wanna One members of the same age went on a trip to the Gyeongsangdo region in Korea. To celebrate the season of spring, the boys especially partook in a lot of activities oriented around nature! 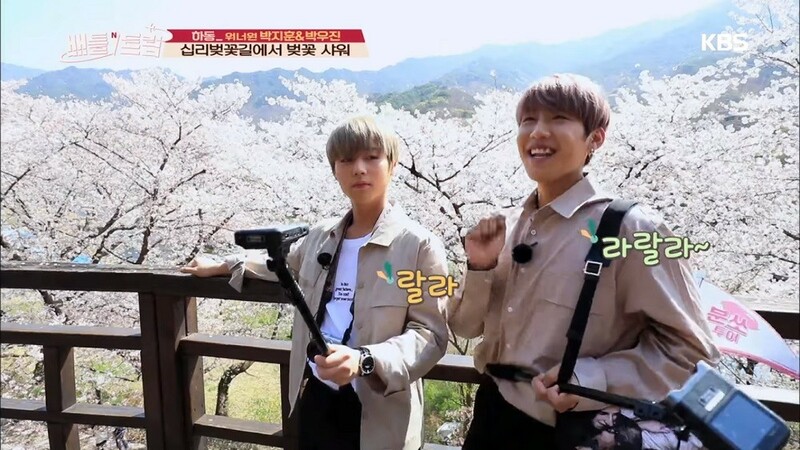 After trying some local meals in the area, Park Woo Jin and Park Ji Hoon went to the Geumo mountain, where they provided the longest zip line ride in Asia. Although the altitude of the mountains were high, the boys tried to hide their fear by saying, "It's the wind that's causing the shivers!" The two idols also visited another location, a promenade graced with a myriad of cherry trees. They took a nice stroll as the petals fell, fully taking in the season's color and beauty. Park Woo Jin even came up with an original song dedicated to flowers, since they were trying to think of songs related to spring! Througout the tour, the two members also drank alcohol together, and played a game banning the usage of English words. This trip of the two Parks went against Choi Yoo Jung and Minah's trip, which aired last week. Check out the links above for this week's tour, and share with us which trip you think seemed more worthwhile!